Iâve always been a fan of Sam Harris. Even when I disagree with some of his ideas (very rare), his arguments are well thought out and presented in a logical way. Iâm happy he changed the name from âwaking upâ though because âwokeâ has become synonymous with âI get all my information from YouTube and Instagramâ.My natural tendency with any public policy is to trend âleftâ... but Iâve considered myself more âcentristâ on a lot of issues in the last couple years... and thatâs okay (even though it seems everyone disagrees with me now and conversationally attacked by both sides... Iâm either a âlibtardâ or not an ally... donât know when that happened). Itâs about âmaking senseâ of what works even if the data and science doesnât support your first inclination. Itâs a well produced show, with a very closed point of view. He masquerades his opinions as science, and then claims to be objective, or somehow more correct, because he doesnât view himself as emotionally involved in a given topic. I used to be a fan, and still so enjoy some guests he has on. But on the whole, I think heâs not too interested in furthering the world, and is more interested in preserving the status quo, which undoubtedly benefits him, and others like him. 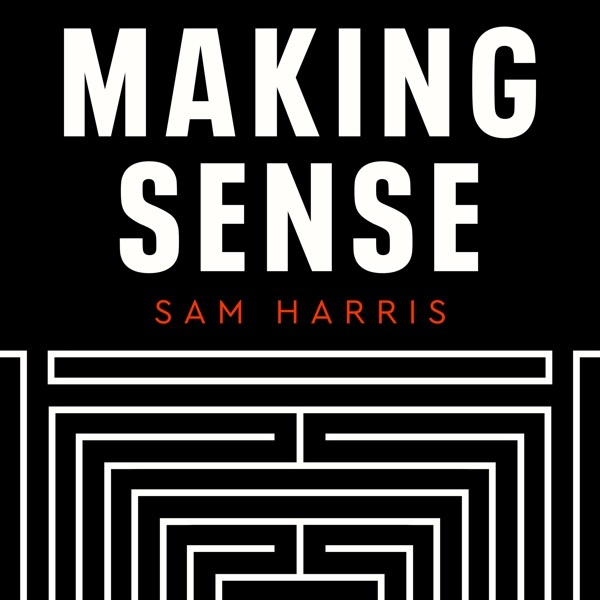 There is always something I learn on these podcasts from Sam Harris and his guests. He deals with large issues that I often find myself wondering about. Likebabgreat aftertaste, youll think even more afterwards. I listen to podcast all day while at work. At a certain point I felt like I was wasting my life listening to true crime and purely entertaining podcast. Making Sense has been a game changer. Not only have I learned lots of invaluable information from this podcast but it has also made me strive to become a better communicator. My mind has opened up to ideas that have made me a more intelligent person over all. Iâve benefited from it in real life, practical ways.Iâve now read Waking Up and use his meditation app daily. The meditation app is a different discussion but in short it has changed my day to day life in a very subtle yet immensely impactful way.At the heart of it I really like Sam Harris. I have so much admiration for his use of words and his commitment to clarity while communicating. I have a lot left to learn from him. He has helped to build a foundation that I can build from. I agree with most of what Sam says but not all. So thoughtful. Russell Brand with whom I have agreed in the past vaguely sometimes ... that episode revealed just how stupid Brand actually is. Yikes. For anyone interested in what the most brilliant among us are thinking, this is a must-subscribe podcast. Itâs a weekly masterclass on a wide range of topics. Sam is brilliant! Great show! Sam Harris doesnât put out a podcast a week! I canât say enough about this podcast. Very educational and stimulating. Ps. His Waking up app is exceptional! I Recently started listening to Sam Harris and I think this is one of my favorites so far. I feel like all of his podcasts are so educational which is one of the reasons I like his podcasts.i would definitely recommend this podcast. Sam Harris is the voice of reason not the advocacy, and his social commentary has a strong factual base. The place where self-improvement and fun overlap the most. sam harris is an important part of my evolution as a human being. his thoughtfulness and grace permeates thoroughly within his books, podcast and mentorship with mindfulness. Sam is definitely a great podcast to listen to, but Iâve found a few things very irritating the more I listen. One, he lowers and calms his voice down at the beginning of every episode, itâs not a huge thing but since Iâve heard him live, and doing interviews and he sounds very different itâs annoying. Two, his dislike for Trump is somewhere between insanity and hilarity, I mean the whole Trump needs to be off Twitter is so ridiculous that I struggle to think Sam is capable of being objective on this subject. Three, please for the love of god release more content and donât worry about editing so much. No one cares if you or your guess mess up a little. Ezra will always hate you and always be a pathetic twerp. Finally, keep it up Sam! Wonderful podcast. Sam is level headed and rational with an ability to explain some very complex subjects. Samâs podcast is complemented perfectly by his meditation guidance and lessons, in his new waking up meditation-oriented program. Each is great, but Iâm especially loving the meditation course. So glad he doesnât get focused on âselling himselfâ like some guru (makes sense given his position on deities, though slightly in tension with his understandable concern for reputation, which isnât as REIFIED as he sometimes treats it as being (sorry, I to put that one word in âall capsâ so the auto-correct function wouldnât change it). I share his concern about being misrepresented (and often intentionally âmisunderstoodâ) however thereâs nothing much we can do except be our best selves. And transcend self as much as possible. He IS far better than so many self-anointed âguruâ types with whom Iâve studied meditation over decades. They all seem to claim âI studied in Nepalâ (or âIndiaâ, etc) but they only did so for a few months or a year. He did 9 years study but never brags about it as particularly amazing to have done. Just interesting and a beginning like everyone is a beginner if truly wise. The others Iâm referring to â Americans I wonât call out by name - havenât the ability to impart what Sam so compassionately does, without letting his own âselfâ get in the way. Itâs a genuine gift heâs offering through this teaching, and heâs not profiting off it as he could. That only serves to underscore the truism that its isnât how many agree or are addicted to looking that makes âcontentâ great (never has been so, still isnât, even if history is mainly written by the relatively powerful). I prefer his intellectual (ie epistemologically humble!) approach to people strangely lumped on with his current material ;as if they were his âcompetition,â eg the Jordan Peterson type.... thatâs like comparing JS Bach with Taylor Swift.... each is fun but one is seriously making good material that will last by influencing so many.... and making his efforts accessible for free if one cannot afford them..... so pay up if you can!). I have never subscribed to a Podcast before Making Sense but I decided to give it a whirl after reading Dr. Harris's books. It has been a fantastic purchase and there are still plenty of previous podcasts left for me to listen to. Spend a few bucks a month and you'll get some insight from many brilliant minds. Sam has always impressed me with his clear minded approach and constant striving to bring clarity and understanding to the topics discussed. Keep up the excellent work, good sir. Listening to Sam Harris is like a breath of fresh air. He is level-headed, wise and compassionate. His voice is so needed in our world and Iâm very grateful that he is out there doing the work that he does. I've followed Mr. Harris' career since he first started writing publicly, and have always appreciated his candid, calm, well-reasoned approach to the most profound and impactful topics of our time. This podcast, like his writing, is usually controversial and always thought-provoking while remaining thouroughly accessible to a broad audience. Thank you for your contributions to the world, Sam. Sam Harris just makes sense. He knows what he's talking about and he tackles the hard questions and even harder conversations.This podcasts changed how I view myself, my life, and the entire world. I have followed Sam for years. There are some things I believe about him that may seem to counter what other say of him. This week is the week of the Christchurch massacre. After years of listening I believe that if Sam was in that church on that morning that he would of placed himself between those targeted and the shooter. If I would have learned that he died while guarding a group of people I would feel a lot of emotions. Surprise would not be one of them. I can not say that about a lot of his detractors. If I was there & I found myself between the shooter and targets (not saying I would. I donât know and never hope find out) But if I was, the part of me that was doing whatever good I could is the same part the hears Sam. That is inspired by him. This is why I listen.... Sams ideas & arguments are much larger than what I hear on any 24 hour news channel. Are far sighted. His goal is not to eliminate any religion from humanity but to try to prevent any future generation from living in fear or shame from any religion or political idea. That if people can find comfort in this world without hurting other people or themselves then that is the path we must choose. These are just a few things I feel I know about Sam via his public profile. How one could truly listen to him and take away any other ideas besides treating others with dignity and kindness baffles me. And another thing. For crying out loud, hitch would of been with her. He wouldnât of loved it but hitch siding with the other option is the most laughable sentence ever punched into a qwerty keyboard. I canât keep paying for content right now. And I know that I spouted a lot of hypotheticals but for those on the fence about listening, doing so has made me a kinder more thoughtful human of all people everywhere unless they hold & abuse power. Thanks Sam, take care. Samâs incredibly honest, thoughtful, and patient with the guests he interviews/converses with about a wide range of topics. He has brought to light issues and flawed ways of thinking that I was previously unaware of. He truly shines light into dark areas. That being said, I would like to see him have more Evolutionary Psychologists on the pod, to date I think Geoffrey Miller was the only one heâs had on. People like David Buss or Steven Pinker (who he says heâs good friends with) would be nice to hear from. Overall a must needed pod amidst all the confusion and faulty perceptions of...well, everything. I canât thank Sam enough for his dedication to providing his unadulterated views and opinions on some of the most critical areas of the human experience. It doesnât take long to recognize the amount of time and effort it takes to walk people through a set of morals and ethics through critical thinking, examples, and irrefutable analogies that can strike a cord with just about anyone willing to listen. Once you understand Samsâ core principles and code of ethics, he takes you on a journey through socially deemed âtabooâ topics without fear of retribution and is the epitome of why more conversations like these are imperative to any attempt to improve humanity. Sam's Waking Up course is life-changing. It is amazing how just 10 minutes a day has helped me become so much more aware of the character of my mind at any given moment and subsequently allowed me to refocus my attention and be more frequently present in my experiences and interactions. I look forward to meditating with Sam daily because I know I am improving my quality of life. Sam and this podcast are a treasure for those who value intellectual conversation in an age of vapid talking heads and political spin. He clearly isn't always right or fair, but he is one of the few honest and gifted people out there trying to make sense of these confusing times. Sam Harris is a great mind many more would do well to listen to, his content and interviews aren't only enlightening, but inspire critical thinking, a desire for knowledge and a want to change what it means to be compassionate and moral. I canât recommend this podcast, his lectures, the waking up app and his books highly enough. I highly recommend Sam's Waking Up course (app) and his book by the same name. They are great complements to one another. It would not be an overstatement to say they significantly changed my life for the better. Thank you, Sam. You really donât know what youâre missing or perhaps better said, what youâre paying too much attention to. Sam Harris does a fantastic job making it painfully clear how to alleviate your own self-imposed suffering. If you want to clean your cognitive space of the excess negative junk, this is the perfect app for the job. Consistently excellent and thought-provoking. I particularly enjoy the fact that the format is not squeezed to a particular length but rather extends to fit the content and conversation, and that it is a conversation and not an interview. It is the one podcast that I regularly forward topics of interest to friends and family. One of the few podcasts that will help you how learn and think. This is definitely one of those podcasts that is 90% fluff and Point list chatter. They take way too long to get the actual conversation going and take way too long to bring up any real conversation points. Great, but ew to the rebranding. Great content, but that new graphic and new music is lacking. These days there is no more important podcast in my library. Bringing the most important modern thinkers to my phone, Sam Harris is gifted as an interviewer on the most important topics of our time. Thought-provoking, deeply insightful and well articulated. Even when disagreements are apparent, Sam always leads a productive conversation about tough topics in todayâs society. What a joy it is to listen to truly meaningful conversations about truly meaningful topics. As always, Samâs well exercised intellect provides a superb primer to exercise oneâs own intellect on the subjects which matter most in our modern lives. Though I am sure he is far too humble to think of himself in such terms, Sam Harris is one of the most courageous, reasoned, mindful, and intelligent thinkers speaking publicly in the world today. The all-star lineup of guests that he draws to the Making Sense podcast is a testament to his global credibility and polymathic chops. His lucid, deductive reasoning, without artifice or "gotcha" constructions, make him one of the most exceptional interviewers you will hear. Essential listening for those curious and thought bubble-averse. Did you check her license or ID to make sure this was the Dr.? She is a blithering idiot who misquoted half a dozen things about 12-Step Programs. Having grown up in these areas as a family member was in AA, she got 80% wrong or out of context. Really really pathetic. Youâre going to get a lot of emails and responses. I love listening to Sam Harris, his rigorous thinking, clarity, and openness to discuss a range of fascinating topics - and the fact he also discusses them people he disagrees with sometimes. I also started using his Waking Up meditation course app, I recommend checking it out, I'm really enjoying that too. This is one of the very few podcasts I consider so essential that I support it financially. In fact, I also meditate using his app. Watching Sam "think in public", and trying to follow along, is a terrific exercise in rationality, and his non-woo approach to spritituality is real-life useful.I don't agree with him on everything but, when I disagree, I'd certainly better have my ducks in a row. As a Christian Conservative, I find Sam and his interview style and insightful conversations very fair minded. I came across Sam in his shared podcast with Ben Shapiro and then Jordan Peterson âdebatesâ. While I may not agree with Samâs point of view on some issues, his conversation style and openness to productive debate is a welcome addition to the partisan world we are in. I can sense that Sam can disagree with many of my values, and make a sound and rationale argument to help me understand his view on the world as an atheist.